Why are Crazy People Called "Mad as a Hatter"? Baki J asks: Why are people who are doing something crazy called mad as a hatter? Although the phrase “mad as a hatter” is, and will likely long be, associated with Charles Dodgson’s (a.k.a. Lewis Carroll’s) 1865 novel, Alice in Wonderland, contrary to popular belief, Carroll neither coined the phrase nor did he use it in his works. 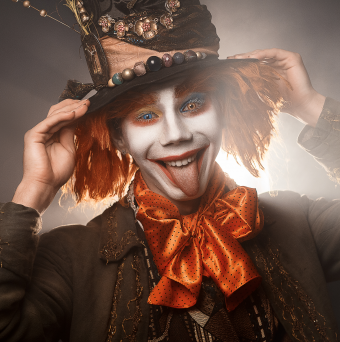 (The Hatter is referred to as “mad”, along with his little tea party, but he is never explicitly called “Mad Hatter” in Carroll’s works nor is the phrase “mad as a hatter” used.) So where did the phrase “mad as a hatter” actually come from? NORTH: Many years – I was Sultan of Bello for a long period, until dethroned by an act of the grossest injustice; but I intend to expose the traitorous conspirators to the indignation of an outraged world. TICKLER (aside to SHEPHERD. ): He’s raving. ODOHERTY (to both. ): Mad as a hatter. Hand me a segar. (And later in the same work) Father he larfed out like any thing; I thought he would never stop – and sister Sall got right up and walked out of the room, as mad as a hatter. Says she, Sam, I do believe you are a born fool, I vow. The leading theory as to the origin of the phrase is that it refers to a genuine condition that began afflicting certain hat makers in the 17th century called “mad hatters’ syndrome” or “hatters’ shakes”. The symptoms associated with this condition were first described in full detail in 1829 by a Russian physician, the same year the first known instance of the expression came about. It continued to be a problem for hat makers through the 19th century in much of the Western world, though in the U.S. it was a phenomenon that continued into the mid-20th century for reasons we’ll get into in a bit. As to the underlying cause of mad hatters’ syndrome, in the 17th century in France, expensive hats made of felt began being produced using mercury nitrate. The method in question seems to have been developed by the Huguenots of France who, after Louis XIV revoked the Edict of Nantes in 1685, which had previously given them certain religious freedoms and rights, were forced to flee to Britain where they soon shared their little trade secret with British hatters, with it spreading from there. The specific felt production method here was to use mercury nitrate in a solution used to strip fur from animal skin (usually from a rabbit or beaver) in a process known as “carroting”, so called because of the orange-ish colour of the mercury-nitrate solution. (Aside: before the 17th century, carrots were predominantly purple, not orange.) The specific benefit to the mercury nitrate here was to cause the stiffer outer hairs to soften and become limp, allowing the hatters to pack them together more easily. After carrotting, the resulting matted fur was shrunk in boiling water and then dried. The processed felt subsequently used for hat making continued to emit mercury vapour for some time after carrotting. Hat makers rarely wore any kind of safety equipment or protective clothing back then and often worked in cramped, extremely poorly ventilated work spaces. Because of this, invariably they were exposed to dangerous amounts of mercury vapours during their day to day lives, culminating in prevalent mercury poisoning among those in the industry. The symptoms of mercury poisoning are numerous and in many cases extremely severe, affecting the heart, brain, lungs, kidneys and in some cases, the immune system, among other things. Most pertinent to the topic at hand, neurological symptoms associated with mercury poisoning can include, but are not limited to, abnormal sensations in the limbs, muscle tremors, erratic mood changes and mental deterioration. The behaviour of those afflicted by mercury poisoning is usually typified by anxiety, extreme timidness and a general desire to remain “unobserved”, usually responding with anger or irritability if this wish is ignored. Back in the halcyon days of the 18th and 19th century when these symptoms were seen simply as a necessary aspect of making nice hats, instead of a debilitating, avoidable health concern, people simply referred to the condition as the “hatters’ shakes” with little effort initially being expended to discover the underlying cause. Over in America, hat makers didn’t fare any better, with those suffering from what medical literature would later more accurately define as “mercurial tremors” experiencing a similar amount of apathy towards fixing or preventing the problem being demonstrated. The condition was also known to some in the 1850s as the “Danbury Shakes”, Danbury being the largest hat-making town in America at the time. A proper regard for the health of this class of citizens demands that mercury should not be used so extensively in the manufacture of hats, and that if its use is essential, that the hat finishers’ room should be large, with a high ceiling, and well ventilated. One year later, Adolph Kussmaul wrote at length about the symptoms of mercury poisoning in 1861, including briefly mentioning hatters in the work. As a result of mercury now correctly being identified as the culprit behind mad hatters’ syndrome, alternate methods of processing the fur were developed over the following decades. The surprise is that men can be induced to work at all in such death producing enclosures. It is hard to believe that men of ordinary intelligence could be so indifferent to the ordinary laws of health… It does not seem to have occurred to them that all the efforts to keep up wages… [are] largely offset by the impairment of their health, due to neglect of proper hygienic regulations of their workshops… And when the fact of the workmen in the sizing room, who stand in water, was mentioned, and the simple and inexpensive means by which it could be largely avoided was spoken of, the reply was that it would cost money and hat manufacturers did not care to expend money for such purposes, if they could avoid it. The man affected is easily upset and embarrassed, loses all joy in life and lives in constant fear of being dismissed from his job. He has a sense of timidity and may lose self control before visitors. Thus, if one stops to watch such a man in a factory, he will sometimes throw down his tools and turn in anger on the intruder, saying he cannot work if watched. Occasionally a man is obliged to give up work because he can no longer take orders without losing his temper or, if he is a foreman, because he has no patience with men under him. Drowsiness, depression, loss of memory and insomnia may occur, but hallucinations, delusions and mania are rare. Rampant mercury poisoning among hatters and felt makers didn’t end in the United States until WW2. In 1941, the U.S. Public Health Service convened a meeting with representatives from the felt and hat making industries to force them to use an alternative method of felt production. While it may seem like they were doing this only out of concern for the workers, in fact they had long known about this particular problem within this industry. The real impetus for finally doing something about it was to conserve mercury for use in the war, with a side benefit being better working conditions for felt producers. With the push, the industry representatives agreed to switch to using a different, well-known method of felt production using prevalent and cheap hydrogen peroxide. In any event, Lewis Carroll would have been well aware of the symptoms of mad hatters’ syndrome, as he grew up in Stockport, one of the major hat making hubs of England at the time. Nevertheless, seemingly intentionally, Carroll’s Hatter, while a bit of an oddball, does not portray the typical symptoms associated with mercury poisoning, such as extreme shyness, shakes, loss of self-confidence, and timidness to an excessive degree. This type of behavior couldn’t contrast more with the exuberant and jovial personality of the character, a fact that probably wasn’t lost on Carroll’s original audience. Later, Carroll further injects a little subtle reference to the syndrome when the King of Hearts tells the Hatter not to be nervous, a seemingly uncontrollable trait of “mad hatters” of the day, lest he execute him on the spot. It has also been speculated (with no hard evidence to back this notion up, so take this with a very large grain of salt) that Carroll based the character on Theophilus Carter, a noteworthy furniture dealer who lived at 48 High Street, Oxford while Carroll was an Oxford don. Carter was considered something of an eccentric who, according to the British Medical Journal, is known to have been called “the mad hatter”, presumably referencing his oddball behavior and the fact that he purportedly almost always went around wearing a large top hat. Pertinent to the topic at hand, Theophilus once invented a particularly useful alarm clock (presented at the Great Exhibition in Hyde Park in 1851) that, at the appropriate time, would tip the bed over, unceremoniously dumping the sleeping occupant on the floor. It has been speculated, again with zero documented evidence backing the idea up, that this particular invention inspired Carroll a little over a decade later to make the Hatter obsessed with time in Alice and Wonderland. What’s a Gander and Why Would I Want to Take It? If mercury poisoning wasn’t enough, New Jersey hatters in the late 19th century had another major ailment to contend with due to the extremely poor working conditions they were made to endure- tuberculosis. In fact, nearly 2/3 of hatters in New Jersey were dead of a pulmonary disease by 30 years old. The rates of mercury poisoning among this same group was reported as high as 50%, with this number thought to be low given that many workers would attempt to mask their symptoms for fear of losing their jobs. In the 1930s, the U.S. Public Health Service reported the condition appearing in a whopping 80% of all felt makers. While it is a bit of a stretch given the aforementioned information, some etymologists propose a second theory as to the origin of the phrase “mad as a hatter”. The word “mad”, of course, is a homonym and while it can be taken to mean “mentally ill; insane”, it can also mean “angry or annoyed”. This second meaning at one point went further and it’s noted that the word “mad” was sometimes used as a synonym for “violent, furious, angry, or venomous”. On its own this doesn’t mean much until you also take into account that the word “hatter” could be a bastardisation of the word “atter” which itself is a further bastardization of the word “adder”, a species of snake from the viper family. Putting these tenuous notes together, the phrase becomes “venomous as an adder”… As we said, it’s a bit of a stretch, but this origin story can be commonly found in many otherwise extremely reputable published works, so at least is perhaps worth a mention. Where did the phrase ..”gone bonkers ” referring to gone crazy come from ? become a two-thousand word article.